Editorial use only. This image may not be used to state or imply endorsement by CERN of any product, activity or service. ALICE 13 TeV proton collisions. 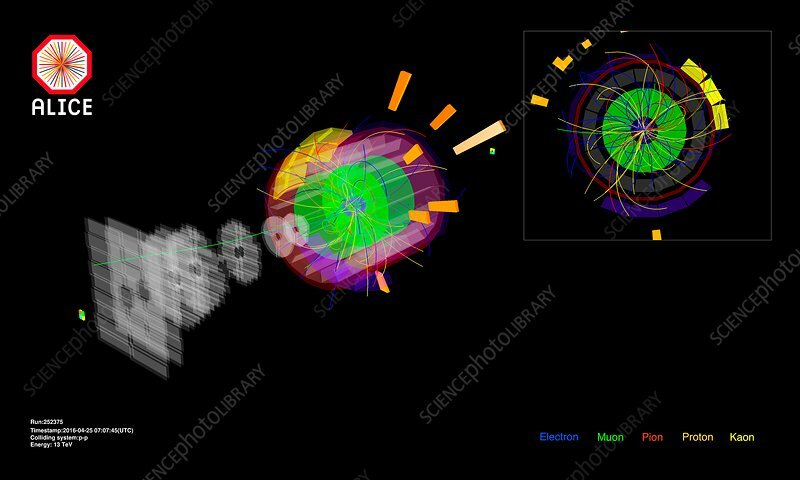 Graphic of the results of proton-proton collisions at an energy of 13 TeV, as recorded by the ALICE detector at CERN on 27 April 2016. The graphic shows one track (green) in the muon arm, tracks in the central barrel and energy (bars) deposited in the calorimeters. The tracks are colour-coded: electrons (blue), muons (green), pions (red), kaons (yellow), and protons (orange). ALICE (A Large Ion Collider Experiment) is a detector built around the Large Hadron Collider (LHC) at CERN (the European particle physics laboratory) near Geneva, Switzerland. The LHC, the world's largest and most powerful particle collider, began operating in 2008. For ALICE, beams of ions are accelerated to collide head-on. The collision energy creates new particles that will decay into other particles. The LHC energies have allowed study of exotic material like quark-gluon plasma, a form of quark matter.